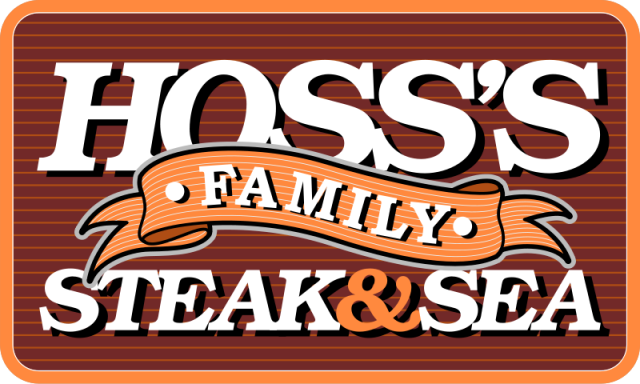 At Hoss’s Family Steak and Sea House, we understand many of our guests may have special dietary needs, food allergies, and/or food sensitivities that may make enjoying a night out to eat a challenge. To help make that process a little less stressful and a little more Hoss’ome, we have compiled nutritional information on all of our menu items for you to access. Because everyone uses nutrition information differently, we provide two different ways to view our nutrition information. In addition, if you would like to download and print the nutrition information, you can do so here. Please note that the nutrition information provided on this site is subject to the HOSS’S FAMILY STEAK & SEA HOUSE NUTRITION & ALLERGEN NOTICE below. The nutrition information provided on this site is comprised of data from an independent testing facility commissioned by Hoss’s, combined with nutrient data from Hoss’s suppliers, the U.S. Department of Agriculture, and nutrient database analysis of Hoss’s recipes using Genesis SQL Nutritional Analysis Program from ESHA Research in Salem, Oregon. The nutrition information is based on standard recipes and serving sizes. Variation in preparation techniques, serving sizes and sources of supply, as well as regional and seasonal differences, may alter the nutritional content of our menu items. In addition, product formulations may change periodically. You should expect some variation in the nutrient content of the food products served in our restaurants. The allergen information provided on this site is accurate and up-to-date to the best of our knowledge. We rely entirely on the information provided by our ingredient manufacturers and suppliers in determining the allergen content of our menu items. This disclosure is limited to wheat, soy, milk, eggs, peanuts, tree nuts, fish and shellfish, the allergens that manufacturers are required to disclose, as well as gluten and msg. Please note that during normal kitchen operations involving shared cooking and preparation areas, it is possible for food items to come in contact with other foods that contain allergens. Due to these circumstances, we are unable to guarantee that any menu item is completely free of allergens. Before placing your order, please inform your server if you or anyone dining with you has a food allergy and we will do our best to accommodate you. We want all our guests to enjoy their dining experience, so we are happy to make any reasonable modifications or substitutions to meals when requested. Several menu items contain fully refined soy oil, which according to the FDA is not an allergen. In addition, testing of new recipes for existing menu items may be conducted from time to time in certain locations. These new recipes may contain different ingredients, including allergens, than those contained in the original recipe. Some restaurants may serve menu items that are not listed on this site. Unless otherwise specified, any food in our establishment may come into contact with surfaces or utensils that have previously contacted wheat, gluten, msg, soy, milk, eggs, peanuts, tree nuts, fish and shellfish.